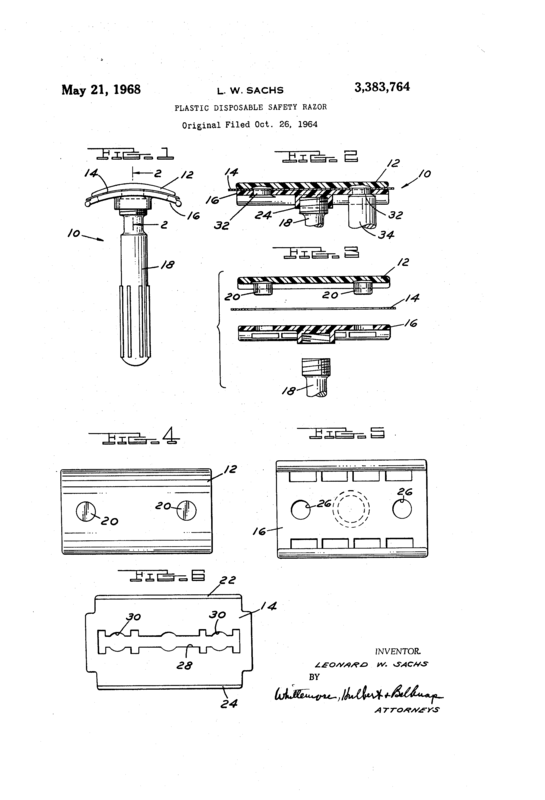 While I personally find disposable razors to be - at best - an unavoidable evil I occasionally must deal with, it can still be interesting to look at old patents for them. Case in point; Mr Leonard W Sachs' patent for a disposable razor with a priority date of 1964-10-26. While modern plastic disposables makes every effort to look and handle like a modern cartridge razor, his design looked very much like any other DE safety razor. Quote: The head and guard members and pins are formed of an inexpensive disposable thermoplastic material deformable by the application of heat and pressure, and the pins have deformed enlarged ends to permanently secure the assembly together. A handle is secured to and projects from the guard member. The patents states outright that the object of the invention was to make a razor cheap enough to be thrown away after one or two uses, yet good enough to provide a smooth shave. Judging by the drawings and description this was achieved. I'm not sure if Mr Sachs ever got his razor into production, but the method of construction looks remarkable similar to some of the medical prep razors you can buy all over the internet today.